We were visiting my sister’s future in laws for a party recently. Her cute sister-in-law, Jenny, brought these scrumptious blondies and they were gone in a matter of minutes….they really are AMAZING! She gave me the recipe, which comes from Lick the Bowl Good, and I could hardly wait to make a batch of my own! If you like cinnamon/sugar combos, this is the perfect dessert for you! A delicious and treat for all cinnamon sugar lovers! Lightly grease a 9 x 13 inch pan. In a large bowl, combine flour, baking powder, cinnamon and salt. Stir to combine dry ingredients completely and set aside. In large bowl, cream together butter and sugar. Add egg and vanilla and beat until smooth. Stir in the flour mixture until well blended, Stir in the cinnamon chips if using. Spread batter evenly in prepared pan. Mixture will be thick and resemble cookie dough. (I used my hands to press it down and smooth the top). Combine sugar and cinnamon for topping in a small bowl. Evenly sprinkle cinnamon sugar mixture over the top of the batter. Bake 25-30 minutes or until done. Yum! These sound delicious. I love blondies so the uniqueness of a snickerdoodle blondie sounds fantastic! 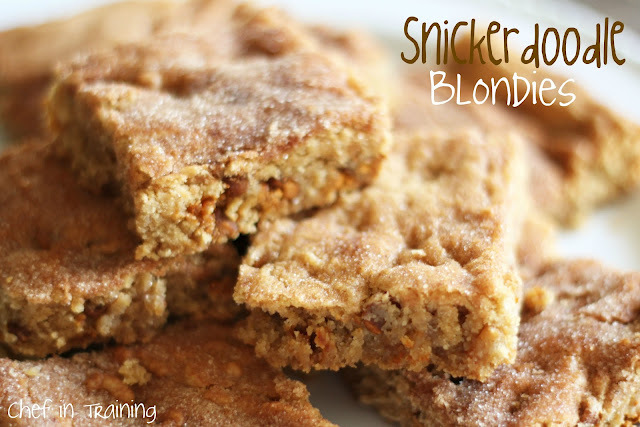 Um - YUM - I love blondies and these sound amaaazing. Yummy! I would love to have one of these with my coffee tomorrow morning! I've heard that it's happening for all non-blogger sites. If you use Blogspot to create your site, you should be in good shape! I love Snickerdoodles and it's pure genius that you made them into blondies! I went looking for cinnamon chips last week with no luck. anyone have any tips on where to find them? thanks! Sounds very intriguing; great way to combine two recipes and bake in a 9 x 13 pan. Cookie monster will make these, cinnamon is good for you, right? Hi Nikki. I'm new to your blog and am glad I found you. I love anything and everything snickerdoodle so when I came across your recipe I knew I had to make them. And let me say...they are DA BOMB!!! I know I'll be making these babies again real soon. I made these for a pool party today. OH MY they are AMAZING !!!!!!!! Everyone loved them. Amazing hit at my ladies gathering! ! ☺u rock! !